Broken Hearted over Crushed Candy over Essie French Affair. This one didn't seem to want to crackle as much over crackle, but it still looks pretty cool. The parts where the pink and blue layer over each other turned purple! I think I like it! Sorry about the blurry pictures. I can not hold my hands still today. They're shaking so bad I'm even having a hard time typing. Bleh! reminds me of easter eggs! Dammit Scrangie! I didn't think I needed to purchase any of the CG Crackles, but now.... !! Nice! It's a cute effect! The colors you used worked. What a cool idea! I have three different crackles so I might just have to try this myself too. Love it! I am definitely getting this! Hahaha the last one is SO TOTALLY LIKE 90s xD. I LOVE it. I'll have to try it when I get these. Ohh...I love the way your combinations came out. 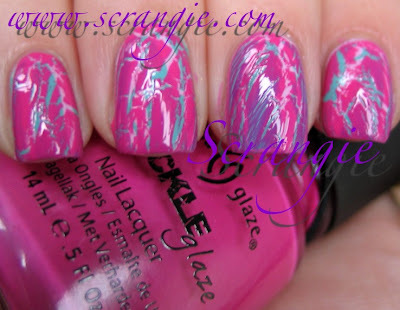 Waiting for my China Glaze Crackle polishes to arrive. Excited! P.S. I finally got hold of the OPI Katy Perry Collection. WEEEE! That 'artwork' is exactly what I thought of when I saw the 2nd picture! I remember it appearing on clothes as well - in thick stripes down the legs of trousers or on the front of a jumper lol! wow, that's all so stunning! i love all of the combos, especially the last one. quite fun!!!! very Very nice,i'll call it,crack on crack! That looks so good! 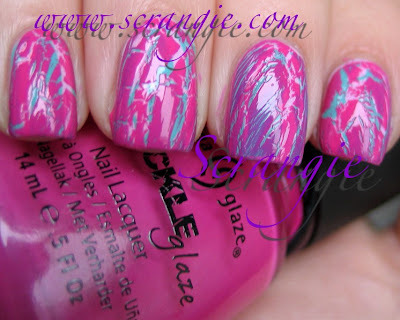 I hope my crackle polishes arrive soon! omg that second one is the bomb! I really dig these combos. What a creative approach! I have Crushed Candy and Concrete... love them both! Great idea to layer these. Love the second manicure the most also.